International economics bodies use different methods to calculate national debt. As a member of the EU, Luxembourg has to record its own government debt following guidelines laid down in the Maastricht Treaty. This standard includes all debt that is represented by formal agreements, such as bank loans and government bonds. In addition to this, guarantees and obligations to EU institutions have to be included as part of the national debt. Eurostat uses these same standards in the economic factors that it reports. The IMF and the OECD have different rules when calculating a country’s debt. The IMF doesn’t include those obligations to EU institutions, such as the European Financial Stability Fund. The OECD includes all of those EU obligations plus all of the guarantees that a government has given for loans to other institutions within its borders. So, the IMF counts fewer factors than Eurostat does and the OECD includes more. The IMF also publishes net debt figures for the countries that it monitors. The figures shown above represent “gross debt.” Net debt is gross debt minus the value of all of the financial assets owned by the government. Luxembourg’s government owns a lot of assets and its net debt to GDP ratio of -8.3%. This means that if the government cashed in all of its financial assets it would have enough money to pay of the national debt and still have a lot of money to spare. Is Luxembourg’s national debt growing? 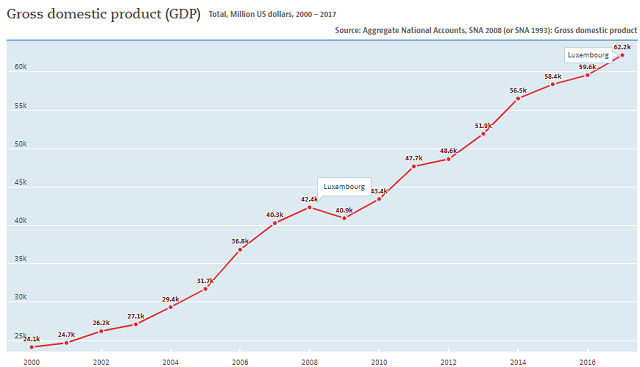 Despite the fact that Luxembourg has enough assets that it could cash in to cover government costs, the country has run a national debt for many years. For the early years of this century, the country ran a national debt that was equal to about 7.5% of its GDP. 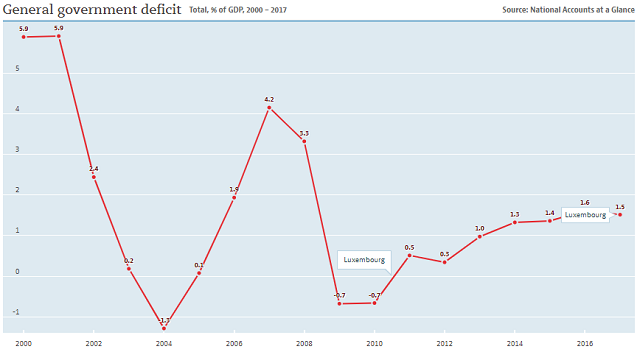 The global financial crisis of 2008 had a big impact on the national debt of Luxembourg — the debt level doubled in 2008 and then continued to rise up in stages to a peak debt to GDP ratio of 23.7% in 2013. After that, the national debt reduced as a percentage of GDP up until 2017 when it rose back up to 2013 levels. 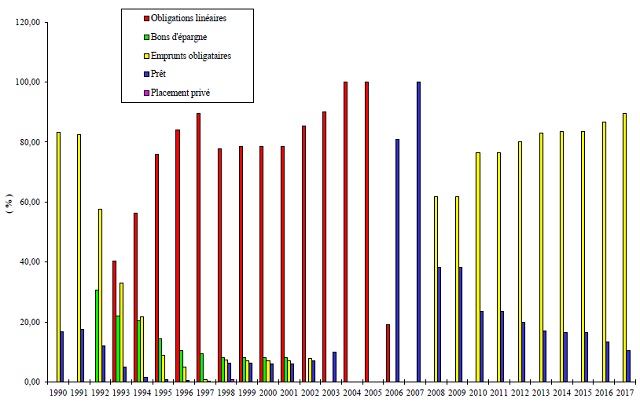 The government of Luxembourg has consistently run annual budget surpluses since 2013. This helped to bring down the national debt until the year 2017. The country’s national debt rose in 2017 even though the government ran a surplus in that year, which mean that it had money to spare and didn’t need to borrow. One reason that a country’s debt to GDP ratio could rise without the government borrowing any more money is if its GDP falls. However, the country’s GDP rose in 2017, as the graph below from the OECD shows. These factors show that the national debt of Luxembourg raised in 2017 not because the government needed to borrow money, but because one of the other elements in the Eurostat calculations of national debt rose — obligations to EU institutions. What is Luxembourg’s credit rating? The credit ratings calculated by the world’s top four agencies for Luxembourg are shown in the table below. Who manages Luxembourg’s national debt? The parliament of the Grand Duchy of Luxembourg has ultimate control over the country’s debt. The administration sets policy and the Ministry of Finance is responsible for setting the annual budget. Debt arises from government spending and so it is the decision of the Ministry of Finance, with the approval of the parliament, that creates the demand for government debt. The Ministry of Finance gives the task of managing the national debt to the State Treasury. How does the Luxembourger government raise loans? All loans are taken out from the Banque et Caisse d'Épargne de l'État. The BCEE is a commercial bank, which is entirely owned by the Grand Duchy. Bonds are known as “Emprunts obligataires.” These are issued directly to a small circle of banks that are on a pre-approved list, known as the “primary dealers.” When the government conducts an auction of bonds, the dealers submit tenders for a portion of that issuance. This system is called the primary market.” Primary dealers are allowed to sell government securities on the Luxembourg Bourse, where anyone can buy them. This is the secondary market for Luxembourger government bonds. 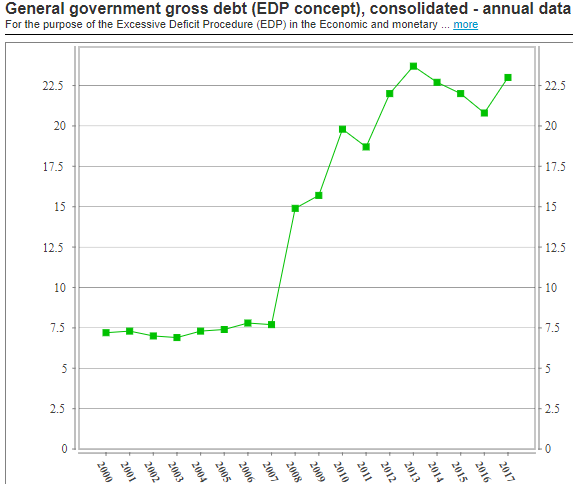 The graph below shows the components of Luxembourg’s national debt by instrument type over the past two decades. All Luxembourg government securities are fixed-rate bonds that are denominated in Euros. There are currently bonds with maturities from 5 to 15 years in circulation on the secondary market. What facts should you know about Luxembourg's national debt? You could wrap $1 bills around the Earth 61 times with the debt amount. If you lay $1 bills on top of each other they would make a pile 1,718 km, or 1,067 miles high.